Despite ongoing tensions, anger and court battles over Confederate war memorials in Virginia and elsewhere, the county attorney told the Board of Supervisors during a public meeting that "this county has no legal authority" to ban the flag, which many see as a symbol of hate. It's located on private property, which limits any steps the government can take, he said. WASHINGTON — The huge Confederate battle flag that flies over Interstate 95 in Stafford County, Virginia, is there legally, despite emotionally charged public opposition, according to the county’s attorney. Stafford County Attorney Charles Shumate told the Board of Supervisors during a public meeting that the flag, which many see as a symbol of hate, is located on private property, which limits any steps the government can take. During Tuesday’s Board of Supervisors meeting, several attendees restated their calls for the board to find a way to take down or lower the flag, which flies near Falmouth. Wyman said her business has suffered, since people who see the Confederate flag flying keep driving. Despite ongoing tensions, anger and court battles over Confederate war memorials in Virginia, and elsewhere, Shumate said there’s little the county can do. 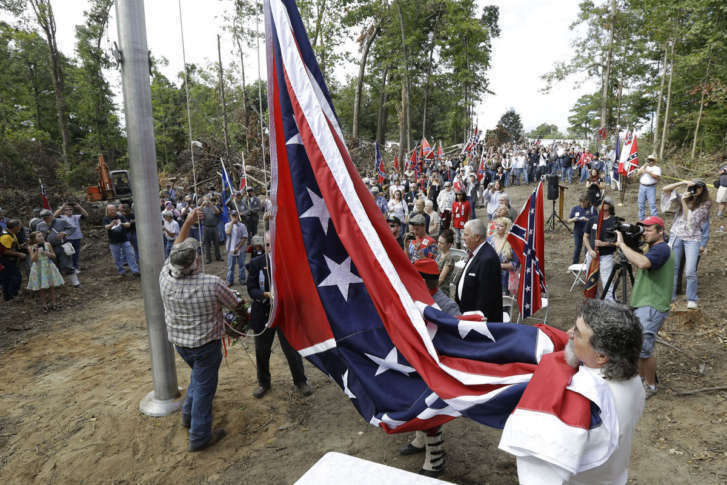 “I have concluded, without equivocation, that this county has no legal authority to require the removal of that Confederate flag, from that private property, on that flagpole, which is 80 feet in height,” said Shumate. An audience member yelled “coward,” as Shumate finished his statement. Several speakers described seeing the flag from the highway as hurtful and racist, recalling the time when black people were only counted as three-fifths of a person. Challenged by one heckler, said his legal guidance was not based on his beliefs. “It’s not my personal beliefs — my belief is in the Constitution of the United States,” he said. Shumate said he can understand the anger and frustration opponents to the Confederate flag are feeling. Shumate said luckily, he has never witnessed a person burning a flag. “I’d have to dig down and really understand, there’s a First Amendment our forefathers created that said, you know, you can’t do that,” he said. Even if the Board were to pass an ordinance, regulating the size and height of flags, Shumate said it wouldn’t affect this case. Shumate said the Board and the individual members would likely be sued. “It sits on posted private land and is protected by the laws and ordinances of the state of Virginia and Stafford County,” said Cash, who leased the land to a group called Virginia Flaggers until 2024. Editor’s note: This story has been updated to reflect that Virginia Flaggers is leasing the property until 2024.